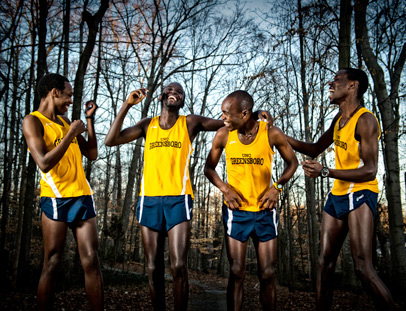 In his first year at UNCG, Paul Chelimo has placed in the top-four nationally. He has been named All-American twice. But his goals as an athlete and a student are much bigger. Sometimes the finish line is just the start. His first year in the United States was spent studying and competing at Shorter, a small NAIA school. He saw that UNCG would be the right fit for him. In the fall, he became the first UNCG runner to become an All-American. He finished 13th at the National Cross-Country NCAA Championships. This month, he became the first UNCG runner to advance to the Indoor NCAA Nationals, where he finished fourth in the 3K, earning All-American status again. The Outdoor season is just starting. Chelimo did not start running until late in high school, in Kenya. “I self-trained,” he explains. “I’d wake up at 6, go run and come back.” His mother encouraged him, and he eventually went to a running camp for one month, where he met future Spartan teammate Paul Katam. “Winning is not easy,” Chelimo says. “I have to work hard.” At UNCG, his coach and teammates lend support. We’re trying to improve health standards in Kenya. Three teammates are from Kenya as well. Paul Katam, an Academic All-American in pre-Nursing, last spring missed by one person advancing from Regionals to Nationals. Abraham Kemboi, a public health major, finished seventh at fall’s SoCon Championship to be first team All-SoCon. In December, Mike Koech received his degree in public health, and is working on a second degree in biology. Each intends to make an impact in his homeland. “We’re trying to improve health standards in Kenya,” Chelimo says. His coach, Linh Nguyen, who was named SoCon Coach of the Year in the fall, notes that Chelimo earned a 4.0 in his first semester at UNCG. “And that’s in a different language,” he adds. The four Kenyan teammates have several times prepared Kenyan dishes for teammates. Nguyen likes the cultural learning and bonding. Some teammates have developed a taste for ugali, a traditional stew, as well as caramel-tasting Kenyan tea. Chelimo’s favorite American dish? Ci-Ci’s pizza. Both men’s cross-country and women’s cross-country took individual and team conference titles last fall. See the UNCG Athletics web site for a season overview. And see the dramatic victory that qualified Chelimo for March’s Indoor National Championships.